A merchant cash advance gives you a lump sum of capital for an agreed amount of your future sales revenue. For example, you might receive a lump sum of $10,000 in exchange for selling to Shopify Capital $11,300 worth of your future sales revenue. 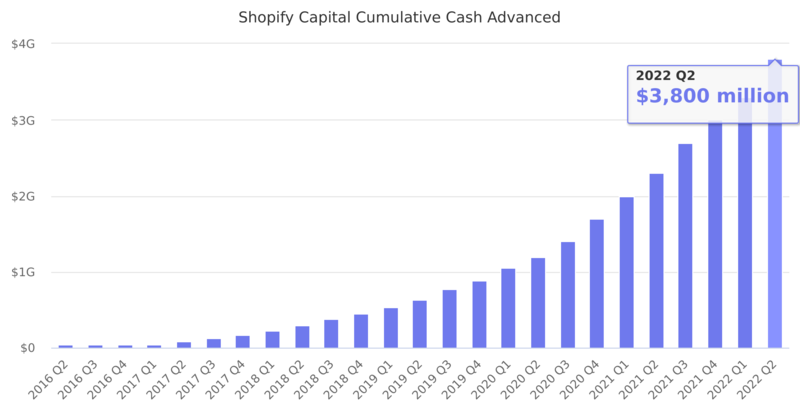 If you're eligible for financing, then Shopify Capital will offer you a choice of merchant cash advances of different amounts, and with different totals to remit and remittance rates. You request the advance amount that's right for you, and if you’re approved, then Shopify Capital deposits the funds in your bank account. As you make sales, you’ll automatically remit to Shopify Capital a fixed percentage (the remittance rate) of your daily sales until Shopify Capital receives the agreed amount of your future sales revenue (the total to remit). Last reported quarter 2018 Q4 it was $447.00 million, up by 163% year-over-year from $170.00 million. From $435.00 million in 2017 it increased by 211% to $1,352.00 million in 2018.